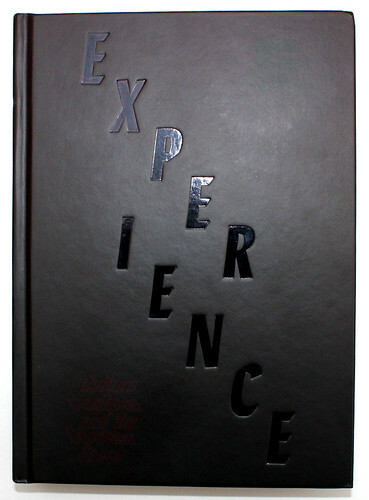 The word ‘Experience’ runs diagonally across a heat sensitive cover, writes John O’Reilly. 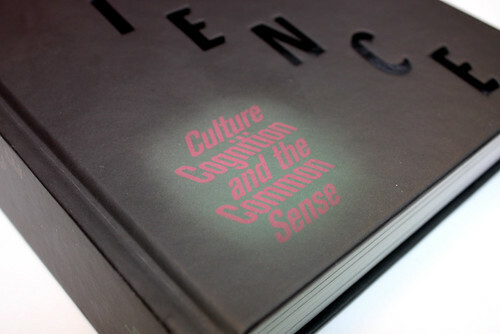 Heat sensitive cover designed by Olafur Eliasson using heat sensitive ink on printed graphic and text substrate. 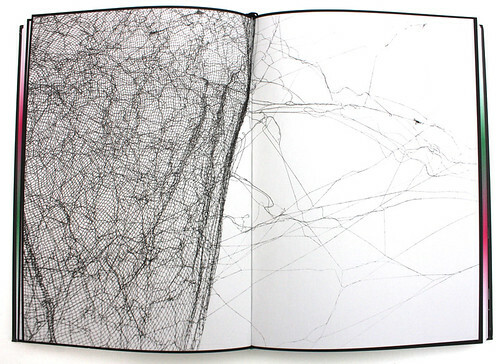 Top: Thomás Saraceno’s Social Strings. 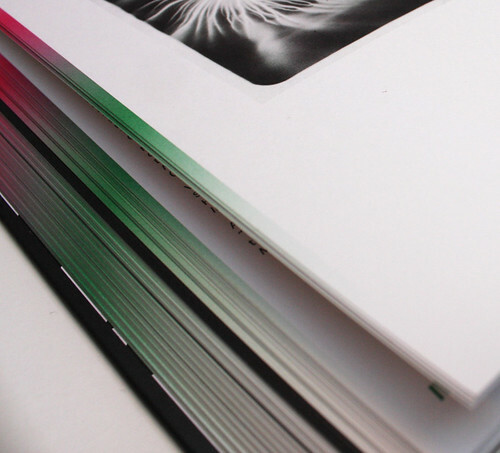 Olafur Eliasson’s cover design is entitled See-through compass (2015). Top right, the three editors’ surnames (Jones, Mather, Uchill) are revealed in green as my thumb presses into the cover. 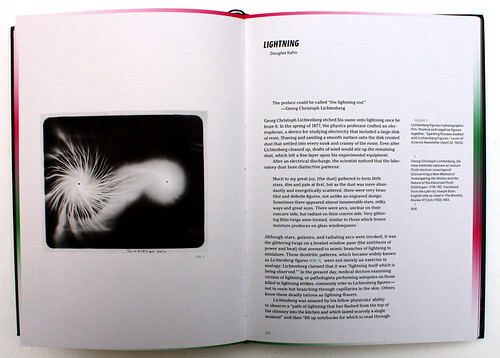 It follows, (and this book explores the practice of following thoughts as they move through the media of type, colour, image and text layouts) that a book about experience would fold the experience of reading into a reflective experience about reading as a visual, tactile, linear and non-linear activity. Running to more 350 pages in hardback, the weighty object ‘affords’ (in the language of psychologist J. J. Gibson) the activity of ‘documentation’, transforming the conventions of reading into auto-ethnography. The book draws attention to one’s habits of reading, learning and making. It designs an idea of experience that it is emergent and changing. I am tapping out this review on the black keys of a laptop, feeling the the letters tip out from my fingers onto the screen. I wrote notes in longhand with my favourite Uniball 0.8 where the ink and ideas flow continuously, soaked up by the paper. My notes document ideas, theories, people, disciplines, but also make me attend to feelings, experiences, of difficulty, surprise, uncertainty, insight, joy, freedom, lostness, wonder, as I encounter the diversity of ideas, images and design features on each page that prompt and probe. The book directs and designs the language of the reader’s engagement, so my first ‘opening’, which I often return to each time in amazement, is the double page by Tomás Saraceno. 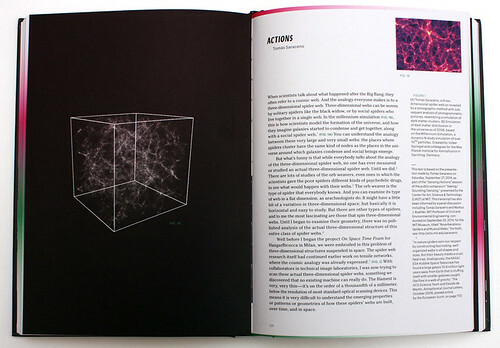 His essay ‘Actions’ reflects on his art installations exploring the use of the ‘web’ analogy in science. It’s followed in the book by a visual ‘piece’ called Social Strings, four pieces of black string dropping on full bleed illustrations of ink-dipped spider webs. Thomás Saraceno reflects on his art installations in the essay ‘Actions’. 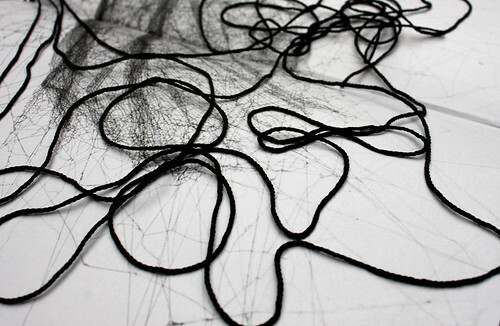 Social Strings (2015) created using black nylon strings and scans of ‘spider map’ prints. The piece is placed within the middle of Experience. Rebecca Uchill (one of the three editors) describes in an opening essay ‘Mediating’ that the strings are meant for ‘entanglement’. A popular word in recent philosophy and the social sciences, ‘entangle’ is used in such contexts to describe how our sense of self and world is singularly constructed at each moment, by social discourses, by our spaces, by the materials we touch and use (and swipe), by the practices and techniques we have adopted to move through everyday life. 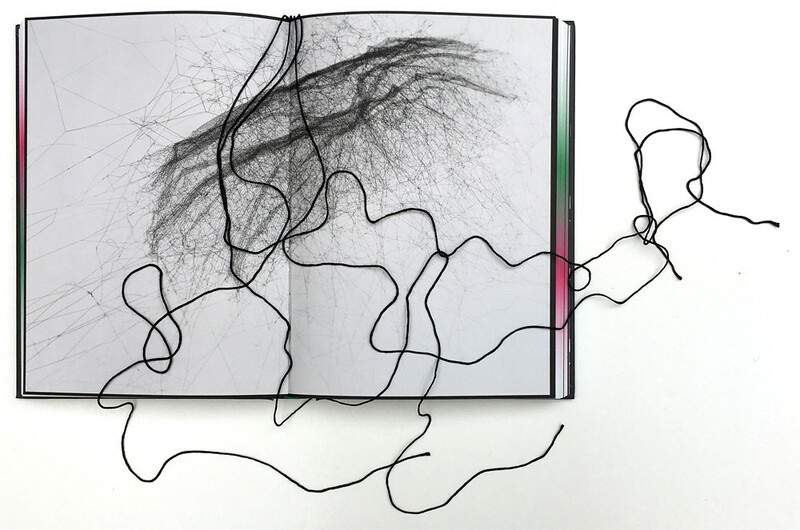 This entanglement, writes Uchill, is meant to take place ‘between the reader and the book, linking ideas and text, or when used in a proximate tangle with a fellow reader’s (copy of) Experience.’ The artifice of the string becomes the idea that animates and frames my reflections on the book. The textual story of Experience is framed by the academic discipline of art history, though the relationship of these two words, ‘Art’ and ‘History’, has been made less sequential through the other disciplines Art History has become entangled with. Consider the job titles of the editors. Editor Caroline A. Jones is Professor of Art History in the History, Theory, Criticism section of the Department of Architecture at MIT; David Mather is Assistant Professor of Art History at the State University of New York at Stony Brook. Rebecca Uchill is cofounder of Experience Economies, a curatorial collaboration, and Mellon Postdoctoral Fellow at the Center for Art, Science & Technology at MIT. Art History in Experience functions like newly minted composite material, with essays from a Professor of Astrophysics, Neuroscientists (whose discursive rise over the past decade would be a productive area of study) , anthropologists, cultural anthropologists, a choreographer, cognitive science and computation, artists, and philosophers both living and dead. More Art Futures than Art History, the opening essays by the three editors — ‘Modeling’, ‘Mediating’, ‘Analogies’ — are followed by sections called Seeing’, Sounding, Sensing, Experiencing. These subjects echo the journey of design as it has moved from the presentational, to problem-solving, to design as strategy, to design thinking, to service design, to designing as an activity that creates for us the cognitive and intellectual capability to experience the world in original ways. It is design not as an assembly of elements that make sense of the past (Art History) and present, but design as an activity that makes the future attractive and less fearful. The first section of the book, entitled ‘Opening’ includes essays from the three editors: Caroline A. Jones, Rebecca Uchill and David Mather. The contents of the ‘Experiencing’ section are mostly extracts from works of philosophers on experience, from: Edmund Husserl whose early twentieth-century phenomenology inspired existentialism: to the American pragmatism of William James and John Dewey at the end of the nineteenth and beginning of the twentieth; to Jacques Ranciere, Michel Foucault and Bruno Latour – both the last two highly influential in theories of organisation, innovation and networks. Yet a traditional hierarchy is maintained in the production of the book. The heat-sensitive cover is by Olafur Eliasson. 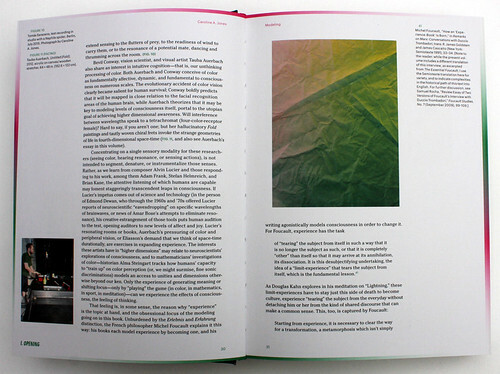 The endpapers, with ink containing synthesized human pheromones estratetraenol and androstadienone, are created by Carsten Höller. The margins and edges of the book are designed by Tauba Auerbach which generate a sense of movement and perceptual liquidity. All artists rather than designers. Back endpapers designed by Carsten Höller are made with the synthesized human pheromone androstadienone. 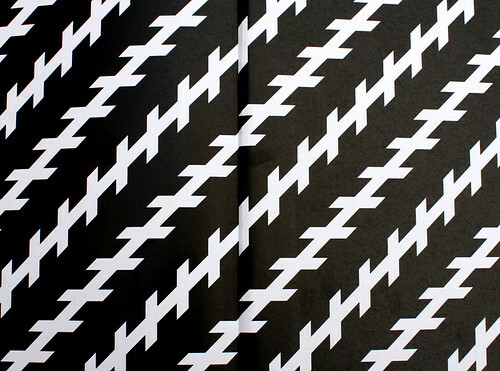 Page edges designed by Tauba Auerbach. As you turn the pages of the book, the green and red edges lend the experience of ‘luminosity’ and ‘fading’ to the readings, a playful, pliable threshold of seriousness and surface at the edge of the intelligent and dense scholarship and thinking. The overall design is by Kimberly Varella with Becca Lofchie, from Content Object design studio. Caroline A. Jones writes in her introductory essay ‘Modeling’, that as ‘art historians, we are particularly concerned to make space for art in these discussions — art as a culturally produced modality for instigating special kinds of experiences that both stretch cognition.’ (p.16). Experience editor Caroline A. Jones’s essay ‘Modeling’. One could make the same case for other activities such as teaching practice, or design, and design in its current more plastic practice as designing situations and experiences for students and clients. The editors’ selection of thinkers such as John Dewey and Bruno Latour (whose thinking figures prominently in the toolkit of any designer exploring user experience) made me wonder whether someone from UX or service design would have added another perspective on experience, although Natasha Schüll, Associate Professor at MIT’s Program in Science, Technology, and Society, covers some UX ground in her essay ‘Tracking’. Equally it would have been interesting to read in Experience a writer working with contemporary notions of ‘affect’ inspired by philosopher Gilles Deleuze’s reading of seventeenth-century philosopher Baruch Spinoza. This notion of affect as a kind of impersonal atmosphere or mood has been influential. Adam Frank’s fascinating essay ‘Feeling’ (on composers Robert Ashley and Alvin Lucier) uses psychobiologist Silvan Tomkins’ work on affect to explore composition and performance, andmakes reference to The Affect Theory Reader, a compendium of essays from this contemporary perspective. Experience made me think how books that think might be designed for people like me who increasingly read on digital devices, and whose reading is habitual in productive and unproductive ways. The enchanting design of Experience encouraged me to entangle with work and thinking beyond the writers and thinkers with whom I’m familiar, the book enabled me to invent new relationships and connections between ideas. Which is the power of design. A 1978 Michel Foucault interview by Duccio Trombadori, first published in 1980 for the Italian journal Il Contributo, adapted for Experience. All photos of Experience by Mariam Dembele.